1. Our bicentennial is approaching. That’s right. In 2019, Colgate will turn 200. The bicentennial will be celebrated all throughout the 2018-2019 school year, which will be packed with events, histories, and ways to connect. Keep an eye on the bicentennial website for information as it is released. 2. 2018 saw a record number of applicants, up 13 percent from last year. Colgate has never been more popular and, last month, we sent out admissions packets to selected students. Last week, we hosted Admitted Student Visit Days. Members of the talented Class of 2022 explored campus and officially began their Colgate journey. 3. We are on track to be carbon neutral by 2019.
Colgate has reduced its gross carbon emissions by 21% since 2009 and is committed to reaching zero net emissions by our bicentennial year. Some successes include renewable energy projects like the geothermal heat exchange system beneath the Chapel House and a solar thermal array installed at 100 Broad. Education programs have helped change campus behavior and reduce emissions. These enthusiastic efforts continue today, the third day of our annual 13 Days of Green. 4. Our student-athletes are killing it. The football team won the Patriot League Championship. Men’s soccer went to the NCAA Sweet 16. Men’s basketball played in the College Basketball Invitational. The men’s ice hockey team made the league quarterfinals. And, of course, women’s ice hockey dazzled on the national stage as they competed valiantly into overtime in the NCAA finals. Oh — and Colgate Athletics achieved all of this while maintaining a 98-percent graduation success rate. 5. Benton Hall is nearing completion as graduates enjoy high success rates. The future home of Colgate career services will open July 1, providing the team with a state-of-the-art environment to help students reach their goals. Colgate is already achieving stellar outcomes. For the last three years, 98.7 percent of our students landed in employment, grad school, a fellowship or scholarship, military service, or long-term community service just 6–10 months after graduation. Recently, Colgate’s internship program also received national attention. We just awarded roughly $660,000 in funding to allow 250 students to pursue unpaid/underpaid internships, research, and service projects this summer. 6. We meet full financial need of admitted students. Colgate meets 100 percent of all admitted students’ demonstrated financial need. Through this investment, we support access to quality education for students from all socioeconomic backgrounds. Our average financial aid award is $52,075 per year, and the average student debt at graduation is significantly below the national average. This extraordinary achievement is made possible by the generosity of our alumni. 7. Campus is becoming even more beautiful. Colgate consistently ranks as one of the nation’s most beautiful campuses, and President Casey is committed to preserving and amplifying that beauty. As part of his Master Landscape Plan, 200 bicentennial trees, representing more than 20 species, will be planted on upper campus as living tributes to Colgate’s rich history and promising future. 8. Record support from Presidents’ Club members. 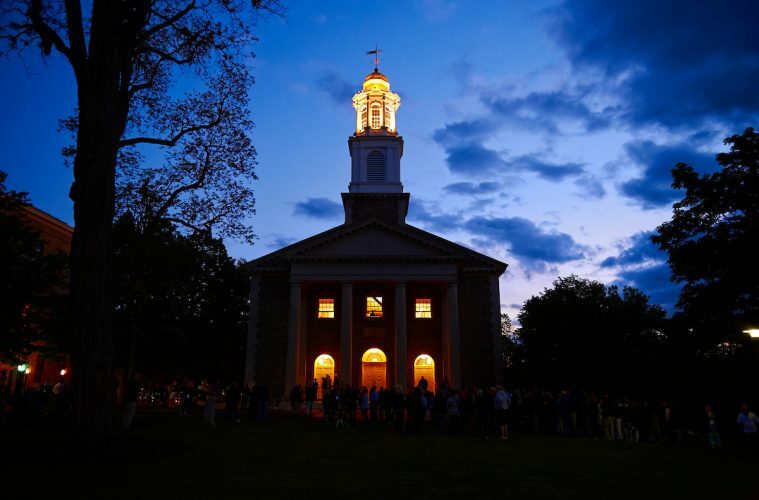 Colgate is receiving unprecedented support from alumni, parents, and students. Last year, the Presidents’ Club, Colgate’s leadership giving society, had 4,420 members — which included 1,005 student members. This year, we’re on track to increase our membership and support even more. What does this mean for Colgate students and alumni? Greater access. A better Colgate experience. Stronger national rankings. 9. Faculty are receiving significant research grants. Colgate currently has 53 active grants from 22 federal agencies and private foundations, involving 42 members of the faculty from 15 departments across the university. Faculty research is thriving at Colgate and our students are benefiting from opportunities to advance human knowledge with leaders in their fields. 10. Alumni are making national headlines. They’re winning Oscars, competing in the Olympics, and leading their industries. Young Colgate entrepreneurs are earning national recognition on shows like Shark Tank and the Today Show. It’s no secret that a strong network helps our brilliant alumni succeed. Colgate Professional Networks take this even further by offering a robust line-up of events to help make those connections happen at an even higher frequency. 11. The arts are thriving. Visual arts, theatre, music, dance — there have never been more options to explore outlets for expression and artistry at Colgate. Currently at the Picker Art Gallery: This Place, an exhibition of the work of twelve photographers who, between 2009 and 2012, spent extended periods of time in Israel and the West Bank. 12. New off-campus study programs continue our tradition of global engagement. Colgate’s newest faculty-led, semester-long study group will immerse students in the social, cultural, and political environment of post-Apartheid Cape Town, South Africa in the fall of 2018. This program was developed with assistance from the Lampert Institute for Civic and Global Affairs. 13. President Casey has outlined a compelling vision for Colgate’s future. President Brian W. Casey recently released documents and videos articulating his Vision for Colgate’s Third Century. The four pillars of this vision include: building and supporting a culture of intellectual rigor; attracting outstanding students; creating and nurturing a community marked by ritual, affection, and pride; and sustaining and improving a campus of striking beauty. The entire Colgate community expects that, with strong beginnings under President Casey’s leadership, the university will enjoy its greatest century yet.